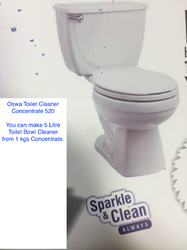 Pioneers in the industry, we offer oswa toilet cleaner concentrate 520 and oswa blue 250 - toilet cleaner concentrate from India. 1 kg Concentrate can give you 4 kgs toilet cleaner. Most Concentrated product in the market. Contains HCL, Ticknener and Blue Colour - you just need to add water. Oswa Blue 250 is a Toilet Cleaner Concentrate which is a blend of Acid Thickner and Blue Dye(Acid resistant) to make Hydrochloric Acid based Toilet Cleaner. It is very easy to use, and economical for small manufacturers. Oswa Blue 250 is available in 500 gms bottle for small manufacturers & 45 kgs Carbouys for bulk buyers and large manufacturers. 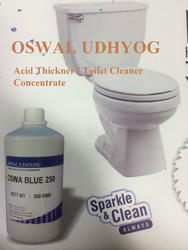 Using 500 gms Oswa Blue 250, upto 22.50 kgs of toilet cleaner can be manufactured.